A 17-year old student at the French Language High School in Sofia is the first Bulgarian teenager to have made a feature film. 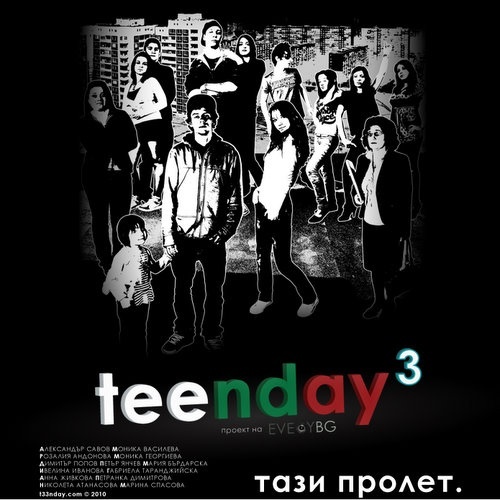 Yuliyan Spasov has single-handedly written, directed and shot a 100-minute feature film, entitled "Teenday 3." The movie is a follow-up to his two previous pilot projects –"Teenday 1" and "Teenday 2." It will premiere on Thursday (May 13) at the Sofia Odeon movie theater and will afterwards be uploaded online and available for free viewing. Renowned Bulgarian director and TV producer, Dimitar Mitovksi, will be a special guest to the movie's Thursday promotional screening. Mitovksi, who is best known for his shorts, "Get the Rabbit" and "Rabbit Trouble", has recently released his very first feature film "Mission London" that broke Bulgaria's box office record. With 46,291 admissions earned over its first weekend, "Mission London," was dubbed by Variety Magazine “one of the strongest Bulgarian domestic releases in a generation and the third highest grossing opener ever”. Sofia-based A Plus Films, which is distributing the pic in Bulgaria, told Variety that the response of moviegoers to "Mission" has been unprecedented with its April 16 opening weekend almost rivaling "Avatar's" total of 48,124 tickets sold.